Blogs have really become popular in the past few years. You don’t have to be a web developer to have an online voice anymore. But sometimes finding the information you want on blogs can be challenging, so I’m creating this handy-dandy cheat sheet for you. I’m going to be using my own blogs as examples. 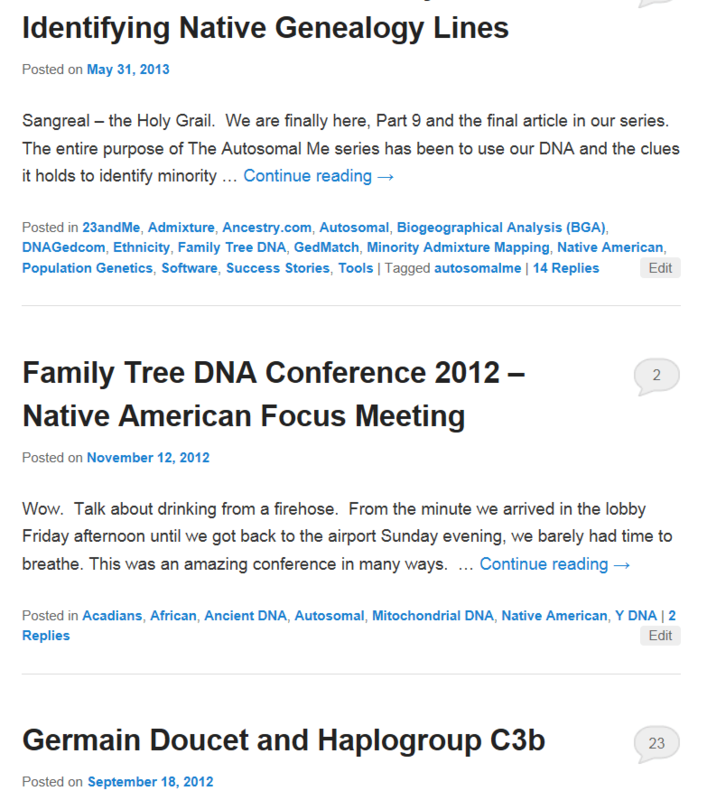 I have two primary blogs, www.dna-explained.com and www.nativeheritageproject.com. Do you want to know a secret? I have a third, secret blog, too. One you’d never suspect is mine. You know you’ve been blogging a lot when you type in a google search and your own blog is one of the primary resources. But it means something else too, it means you’re optimizing the blog for search engines and it’s working. So as a consumer, the one searching for information, to begin with, use google and try a number of different word combinations. Good blogs should include a meaningful title and the topic phrases should be repeated within the document and in any subheadings within the article. The author controls this, but there are some other tools that you and the author can both control. Blogs can do something else as well. WordPress blogs have both categories and tags. The blog author creates both, and they are ways of categorizing and organizing blog entries, optimizing blogs for search engines and facilitating user searches. For example, if you look at either of my blogs, scrolling down the right hand side, past recent posts and archives, you’ll see a number of categories. On www.dna-explained.com, the first category is 23andMe. Clicking on that category will show you all of the articles that I tagged with that tag name. Pretty slick, huh. The second category list is Acadians. Instead of clicking on the category, let’s just use the search button. On my blogs, the search button is near the top right of the blog. Search buttons always look like a magnifying glass. You can see it below in the far upper right hand corner. If you type Acadians into that search box, you will get a list of all of the articles that include that category or that word. These are the first three shown. Tags are another way of categorizing blog articles. 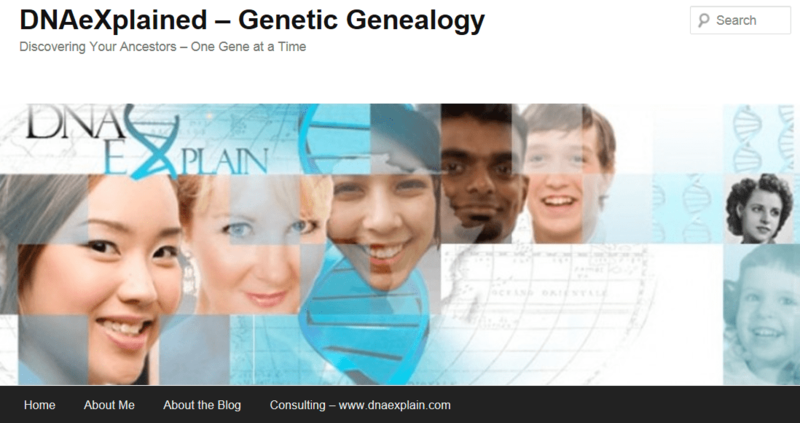 On my www.dna-explained.com blog, I currently have only one tag and that tag is to organize the articles in the series called “The Autosomal Me” so that they can be retrieved together read as a sort of book. If you type the words “The Autosomal Me” into the search box for my blog, you will see a list of newest to oldest articles that include those words, tags or categories. Only the first two are shown below. In this case, the first article shown, because it is the newest article, is a summary article I wrote about the series. Look below the first few lines of text, and you will see the categories I’ve attached to the blog: Admixture, Autosomal, Education, Minority Admixture Mapping, Native American. After this list, you’ll see the word “Tagged” and it will show you the tag associated with this entry. The tag is “autosomalme.” The nice thing about tags is that you can send someone a tag url and then they can see that same list. Click on the tag, “autosomal me.” You will see all of the articles, oldest to newest, that are associated with that tag. If you want to send this list to someone for reference, then copy/paste the url which is http://dna-explained.com/tag/autosomalme/. The function of tags and categories sometimes overlaps, but in this case, it is really nice because I can categorize it in the normal way and then use a completely separate tag to organize it outside of categories. 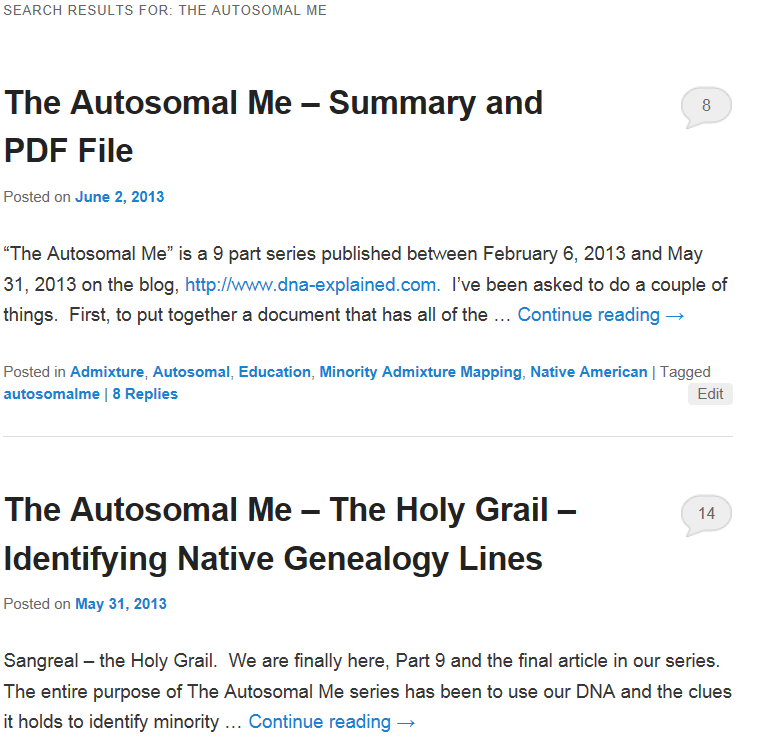 There are other articles that include the words and categories of “autosomal” for example, but for people who want to reference this series only, the tag “autosomal me” takes care of that and only shows those articles. Ok, now let’s have a little test. Tee hee. To see the most popular postings on my “Things That Are Pink and Shouldn’t Be” blog,” search for the word “thong.” Yes, seriously. Don’t worry, you won’t see anything you wouldn’t see on a beach. This entry was posted in Blogs, Tools and tagged Basic Education by Roberta Estes. Bookmark the permalink.